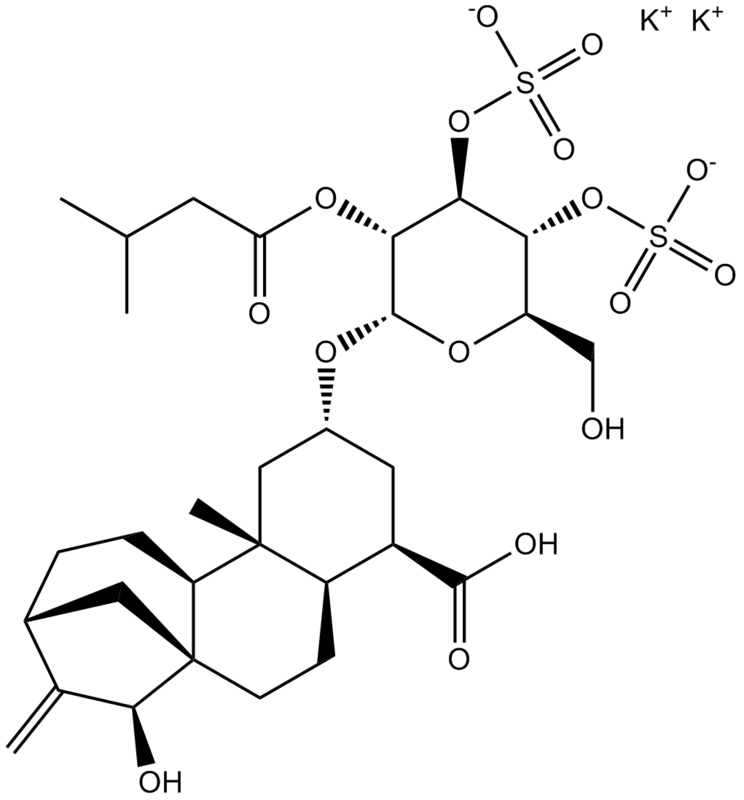 The solubility of this compound in DMSO is > 37.05 mg/mL. General tips for obtaining a higher concentration: Please warm the tube at 37 ℃ for 10 minutes and/or shake it in the ultrasonic bath for a while. Stock solution can be stored below -20℃ for several months. In cultured Ehrlich ascites tumor cells, atractyloside (3 mM, 24 h) inhibited cell growth by 70% with not severe influence on cell viability. Atractyloside retarded cell cycle progression. After transfer of atractyloside treated cells to normal medium, proliferation and macromolecular synthesis normalized within 3 to 6 h. Atractyloside increased glucose consumption and lactate production. Lactate/glucose ratio was 1.9 after 24 h. Atractyloside reduced oxygen uptake. Atractyloside increased the ATP/ADP concentration ratio in the mitochondrial and extramitochondrial compartment. Atractyloside dose-dependently induced apoptosis in normal J2-3T3 cells and cervical carcinoma cells by loss of cell viability, nuclear fragmentation and DNA laddering. The sensitivity of cells to atractyloside-induced apoptosis was found to be: HPV 16 E6-J2-3T3 > CaSki > normal-J2-3T3 cells approximately ts p53-J2-3T3 approximately vector-J2-3T3 cells > Hela > SiHa > C33A approximately C33A 16 E6. Atractyloside can induce opening of the mitochondrial permeability transition pore (mPTP) in arteriolar smooth muscle cells (ASMCs). Treatment with 7.5, 10, and 15 μM atractyloside for 10 min significantly reduced the relative ATP content in ASMCs by 48%, 63% and 66% of control, and ASMCs were hyperpolarized.
. Pick-Kober K H, Schneider F. Proliferation, macromolecular synthesis and energy metabolism of in vitro grown Ehrlich ascites tumor cells after inhibition of ATP-ADP translocation by atractyloside[J]. European journal of cell biology, 1984, 34(2): 323-329.
. Brown J, Higo H, Mckalip A, et al. Human papillomavirus (HPV) 16 E6 sensitizes cells to atractyloside‐induced apoptosis: Role of p53, ICE‐like proteases and the mitochondrial permeability transition[J]. Journal of cellular biochemistry, 1997, 66(2): 245-255.
. Song R, Bian H, Huang X, et al. Atractyloside induces low contractile reaction of arteriolar smooth muscle through mitochondrial damage[J]. Journal of Applied Toxicology, 2012, 32(6): 402-408. 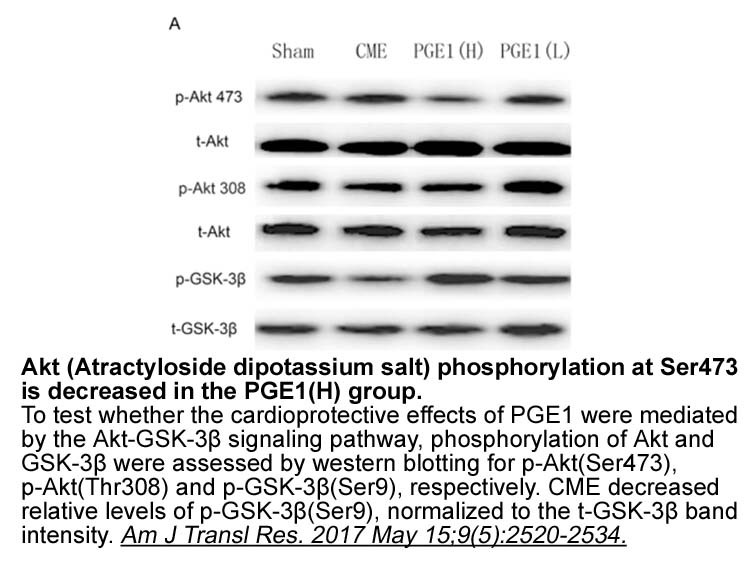 Atractyloside Dipotassium Salt is an inhibitor of ADP/ATP Translocase. ATP-ADP translocase (AAT) is a mitochondrial ADP/ATP carrier. It transports ATP from the mitochondrial matrix to the cytoplasm and transports ADP from the cytoplasm to the mitochondrial matrix. In Ehrlich ascites tumor cells, atractyloside (3 mM) inhibited cells growth by 70%. The mitochondria became spherical shaped with translucent matrix rid of cristae. When transfered to normal medium, proliferation and macromolecular synthesis recovered to normal levels within 3 to 6 h .
In the sarcoplasmic reticulum vesicles from the rabbit skeletal muscle with 10 μM of cytoplasmic Ca2+, atractyloside reduced the rate of choline+ influx through the Ca2+ channels to 60%. Also, it inhibited about half of Ca2+ channels incorporated into planar bilayers . In mitochondrial membranes isolated from a rat heart muscle, atractyloside (5-100 μM) inhibited the chloride channels in dose-dependent way .
. Yamaguchi N, Kagari T, Kasai M. Inhibition of the ryanodine receptor calcium channel in the sarcoplasmic reticulum of skeletal muscle by an ADP/ATP translocase inhibitor, atractyloside. Biochem Biophys Res Commun, 1999, 258(2): 247-251.
. Pick-Kober KH, Schneider F. Proliferation, macromolecular synthesis and energy metabolism of in vitro grown Ehrlich ascites tumor cells after inhibition of ATP-ADP translocation by atractyloside. Eur J Cell Biol, 1984, 34(2): 323-329.
. Malekova L, Kominkova V, Ferko M, et al. Bongkrekic acid and atractyloside inhibits chloride channels from mitochondrial membranes of rat heart. Biochim Biophys Acta, 2007, 1767(1): 31-44.